Born in Dallas Texas in 1921 Jimmy Giuffre started his career arranging for Woody Hermans big band. His main instrument was the clarinet but he also played the flute, tenor and alto saxophone. 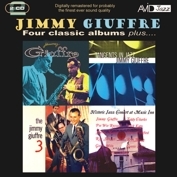 Acknowledged as one of the leaders in the West Coast Cool Jazz scene of the 1950s AVID Jazz here presents four classic Jimmy Giuffre albums on a finely re-mastered and low priced double CD. Jimmy Giuffre; Tangents In Jazz; The Jimmy Giuffre Three and Historic Jazz Concert At Music Inn display Giuffres style which moved from what he called blues based folk jazz to a more intimate and rhythm less form of free jazz dubbed chamber jazz. A style that would be taken up later and with incredible success by the German based ECM label. In fact Giuffre would later record for them with Paul Bley and Steve Swallow. As tribute to Giuffre who died two days short of his 87th birthday on April 24th 2008. AVID are proud to add his name to their growing AVID Jazz catalogue.